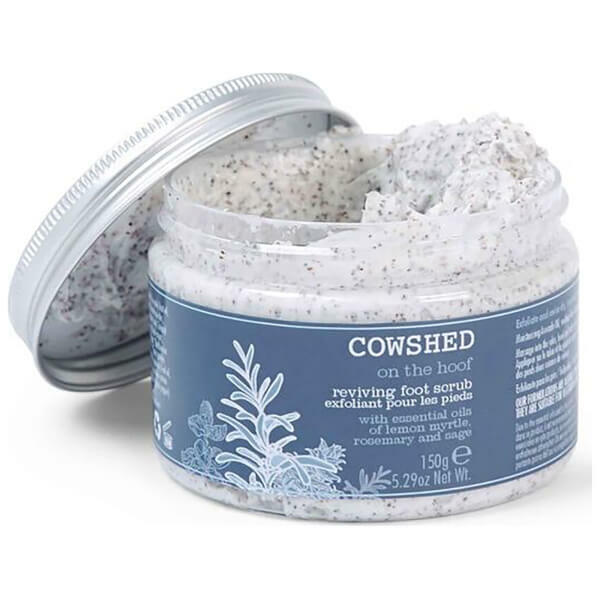 Soften and moisturise from heel to toe with Cowshed's On the Hoof Reviving Foot Scrub; a luxuriously rich formula inspired by the walled garden at Babington House. Infused with Lemon Myrtle, earthy Clary Sage and invigorating Rosemary Essential Oils, the scrub delivers a refreshing herbal scent, whilst natural Black Volcanic Sand buffs away dead, dry and cracked skin on the heels. Feet are left smooth, comfortable and subtly fragranced. Massage into the soles, heels and balls of your feet concentrating on dry areas. Rinse off. Aqua (Water/Eau), Glycerin (Vegetable), Persea Gratissima (Avocado) Fruit Oil, Cetearyl Alcohol, Glyceryl Stearate, Pumice Powder, Prunus Persica (Peach) Kernel Powder, Prunus Persica (Peach) Kernel Oil, Triticum Vulgare (Wheat) Germ Oil, Volcanic Sand, Cetearyl Glucoside, Menthyl Lactate, Zinc Ricinoleate, Aloe Barbadensis (***Aloe Vera) Leaf Extract, Sodium Stearoyl Glutamate, Benzyl Alcohol, Dehydroacetic Acid, Xanthan Gum, *Backhousia Citriodora (Lemon Myrtle) Leaf Oil, *Citrus Nobilis (Mandarin Red) Peel Oil, *Citrus Grandis (Grapefruit) Peel Oil, *Pimenta Acris (Bay) Leaf Oil, *Rosmarinus Officinalis (Rosemary) Leaf Oil, *Salvia Sclarea (Clary Sage) Flower Oil, *Salvia Officinalis (Sage) Leaf Oil, *Boswellia Carterii (Frankincense) Gum Oil, *Eugenia Caryophyllus (Clove) Bud Oil, *Piper Nigrum (Black Pepper) Fruit Oil, *Limonene, **Linalool, **Geraniol, **Citral, **Eugenol.